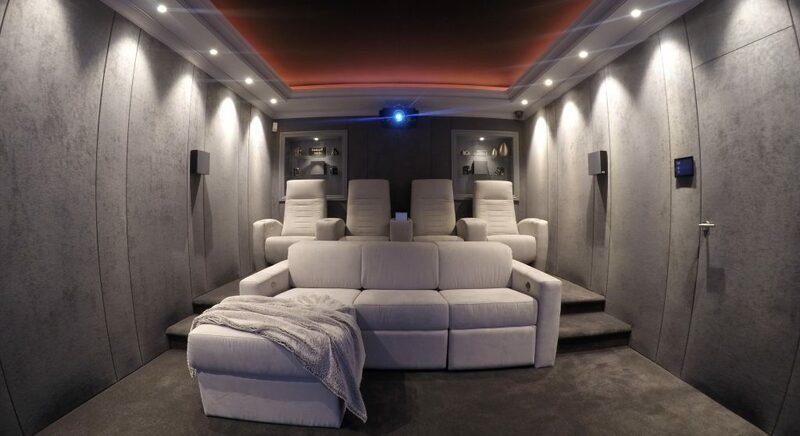 We first made contact with Bespoke home cinemas through our social media accounts. We had been following each others work within the industry and had been impressed with what we had seen. We decided that showcasing our work in their Leeds showroom would be beneficial for both parties. Melanie and Gifford decided on the design and picked a fabric from samples we had sent. We fitted our 9mm tracking system in vertical panels to side and rear walls, including a shadow gap in between panels. We also fitted our 9mm system to front wall, around the recess behind the screen. All panels were in-filled with our acoustic wadding to enhance the listening environment. A grey crushed velvet was chosen as the wall fabric to give the room a cosy, luxurious feel. We fitted our tracking system to upper ceiling area, in-filled with acoustic wadding and covered with black acoustically transparent fabric, concealing the ceiling speakers, which helps to dim the reflection from the screen. All parties were very happy with the results and the customers entering the leeds demo room are constantly impressed with what the team at bespoke home cinemas have to offer.